We are a group of Spinone owners who have co-ordinated informally over the years to help rescue and rehome Spinoni in mainland Europe. We are Registered UK Charity Nº 1179864. Join our mailing list to keep informed. 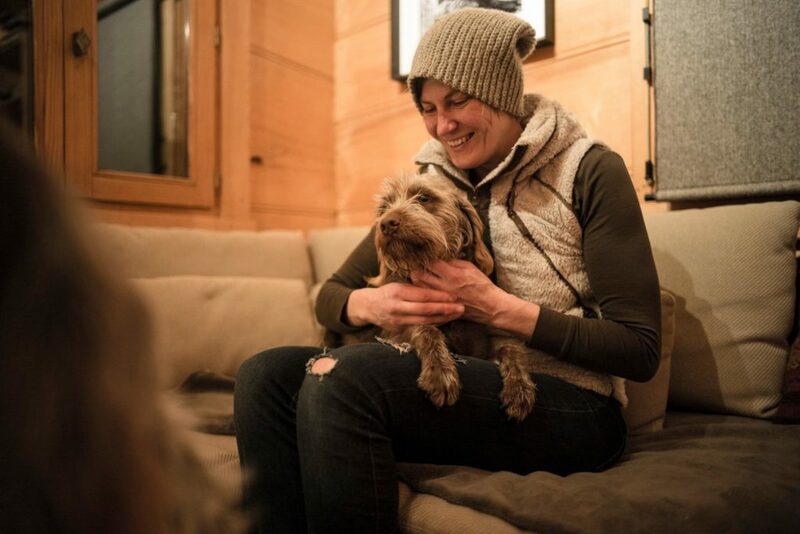 “We always had rescue dogs as part of my family growing up, and as soon as we got married in 1999, Phil, my husband, and I got our first dog, a Wynsett Spinone called Frankie. 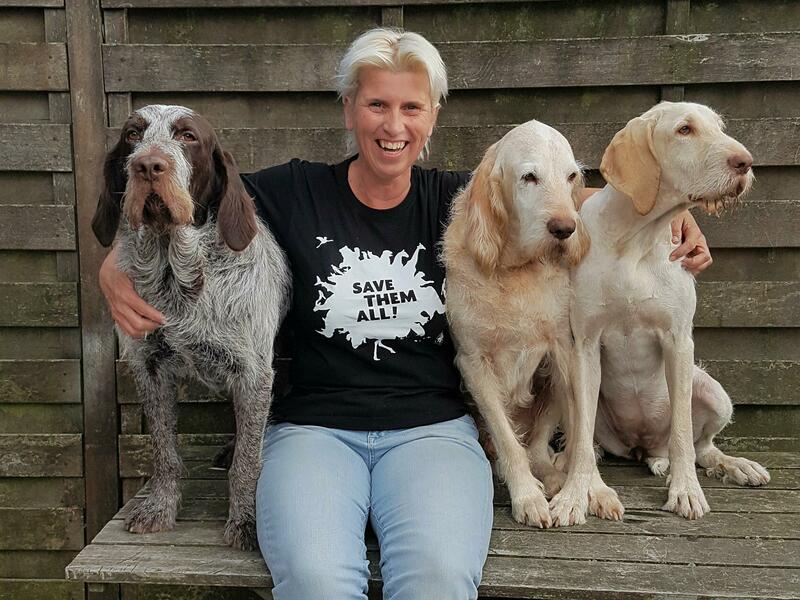 My interest in helping dogs less fortunate than my own find their “happy endings” developed throughout my adulthood, starting in the UK and developing in to International rescue as I became aware of the plight of dogs overseas through social media.” Read more of how SOFA started here. 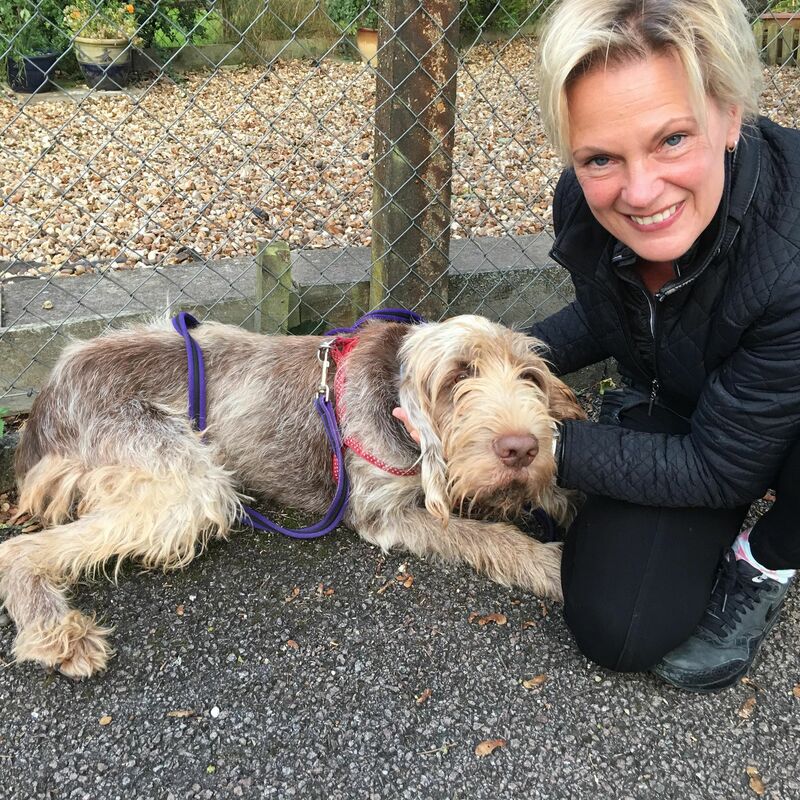 Sarah-Jane meets Italian Jewel Fer, rescued in 2016. 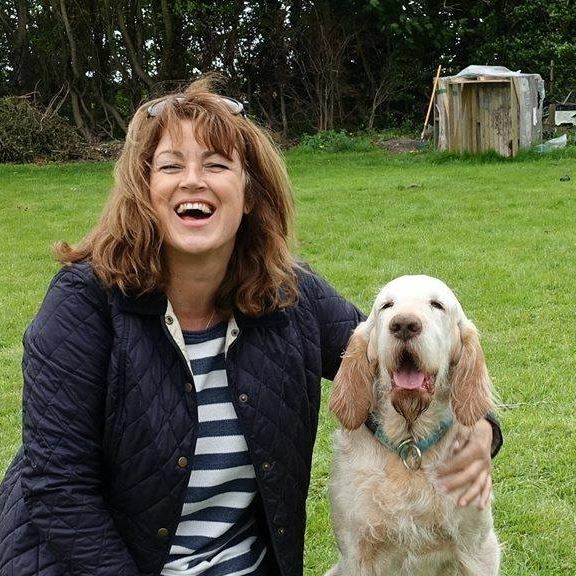 “Having never been allowed a dog as a child, the first thing I did when my husband and I got our own home, 24 years ago, was to get Murphy our beloved golden retriever. Getting a dog was a much higher priority than getting married! Since then we’ve always had dogs in our home. Murphy was joined by Roger (another retriever) and then last year we were lucky enough to rescue Dolly from Cyprus – she had been abandoned with a litter of puppies and was only 18 months old. She is an absolute joy and it has been wonderful to see her confidence grow and grow. Our main priority was to make sure she was never afraid again. She’s now safe and happy in her forever home and she’s become the most loyal, loving dog anyone could wish for with a beautiful sparkle in her eyes. 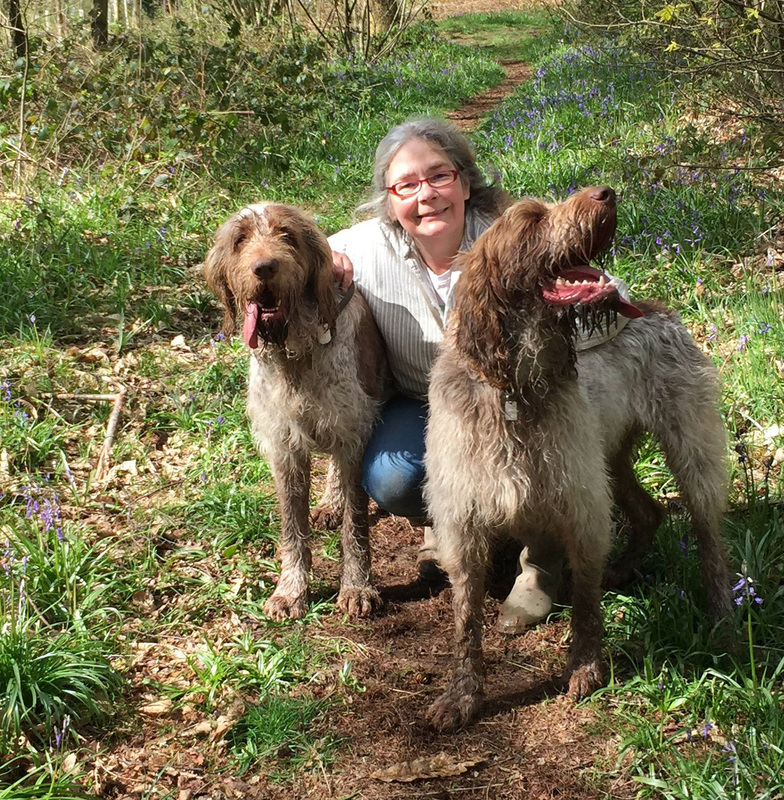 When Bruce (another retriever) arrived later last year, she took him under her wing and very quickly trained him for us, although she could have missed out the escapology section of the training manual!! “More than 20 years ago, my husband and I wanted a dog. At the time we had two long-haired dachshunds, and we wanted a bigger dog. We adopted a Lucerne Hound – 6 months old, very neglected and with severe hip dysplasia. We wanted to give this dog a chance to enjoy life. He didn’t ask to be put in this world. With patience, love, security and trust he eventually became happy again. We have never regretted it. From that moment on we always had several dogs in our house, who deserve a second (or third) chance. We believe that every dog must have love in his life. Astrid with Accio, Fer and Isotta, all rescues from Italy. As a family we have always had dogs, and recently we became more aware of the plight of dogs from overseas when my daughter heard of the Jewels and the desperate situation which they were found in. She offered to adopt, and Massimo the Jewel joined her and our extended family. Next to arrive was Rocco the Jewel who through no fault of his own was back in Kennels, and last year Baldo, a Spinone x Bracco pup, joined us from rescue. All had come from dreadful circumstances. Now with lots of love and kindness they are all doing really well, it is the one of the most rewarding things we have ever done. We have also met some wonderful caring people along the way. We feel very fortunate to be able to give such gentle souls a new and happy life. Jacky with Italian Jewel Rocco on his arrival. 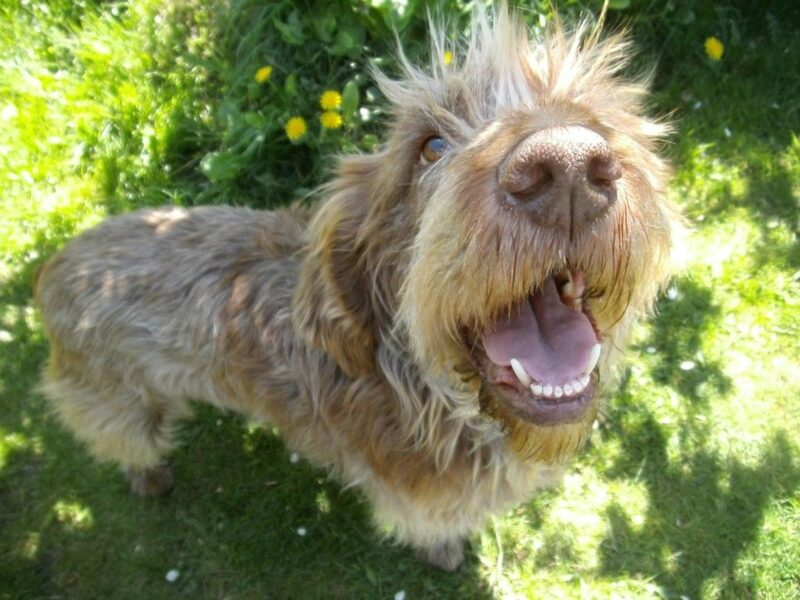 The Italian Spinone Dog Lovers Club group on Facebook, who have helped fundraise tirelessly. The ENPA in Treviso and all their staff who work so hard to rescue dogs in Italy and to help coordinate for us. Julie Ridl of Spinone Love for her generous permission to use her wonderful drawings. The many many volunteers, fosters, home checkers, drivers, organisers…the list is endless and the gratitude of the dogs is boundless.